Does this make me Warchief? Weighing in at 18 pounds and forged from steel, Epic Weapons' Doomhammer replica is one mighty meat tenderizer. If I can scrape up $300 we might have a new banhammer on our hands. 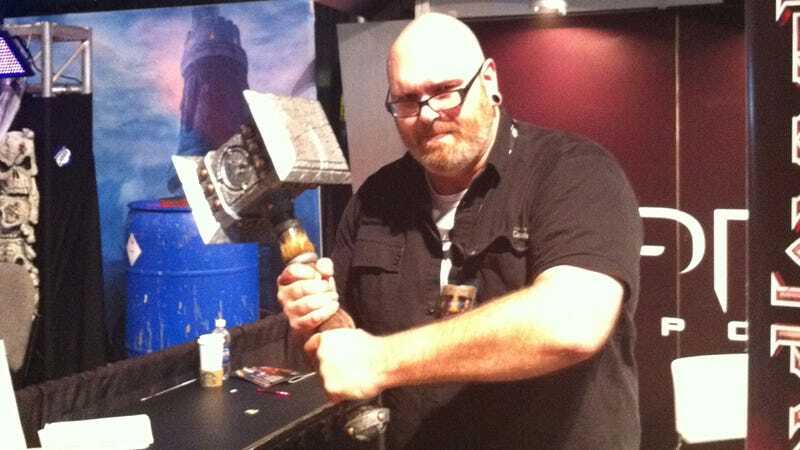 The Doomhammer is the weapon of the Orc warchiefs in World of Warcraft, passed down from father and son over the ages. Thrall himself wields it, the weapon given to him during the flight of the Orcs from their homeworld of Draenor. I might have that wrong; either way it's a pretty important piece of equipment. There are actually two different Doomhammers at BlizzCon 2011 this weekend. One, available for purchase at the BlizzCon store for under $200, is a live-action role-playing weapon, crafted of PVC and foam and then painted to look extremely similar to its weightier, more expensive inspiration. The one I'm holding here is the real deal, or as real a deal as you can get. It's made by Epic Weapons, the same company that made the gorgeous reproduction of Frostmourne a few years back. It's up for preorder on the Epic Weapons website for $284.95, a small price to pay for the ultimate in home security. "It was actually given to Thrall from Orgrim Doomhammer(the previous warchief) while they were releasing the Orcs from the human encampments they were enslaved in after they came from Draenor to kill the humans and lost the war. Doomhammer and Hellscream were helping Thrall and Doomhammer was killed in combat, named thrall the new warchief and gave him both his armor and his Doomhammer. I'm stuck out training in the desert for the Afghanistan, so I brought most of the Warcraft books to occupy my time. Just a little nerdom for you."